Hymenocallis (amaryllidaceae) is a flowering bulb of many names, ‘Spider Lily’ or sacred ‘Lily of the Incas, peruvian daffodil’, ‘Ismene’ and sometimes ‘sea daffodil’. Commonly sold as the Peruvian Spider Lily be careful is you after a specific species as over 50 have been identified, some more garden worthy than others. They are species are a perfumed flowering bulb with attractive flowers. The flower of the ‘Spider Lily’ are a trumpet shaped with a spidery edge like a large ‘hoop petticoat with frills’ plants will reach around 40cm. With a natural habitat from southern America through Mexica to Peru and Venezuala they are a varied group, however growing conditions are remarkably similar. They like damp conditions, a little shade and no frosts. H. harrisiana which flowers early in spring. H.littoralis with its has creamy flowers on long stems and H. littoralis “giant”. 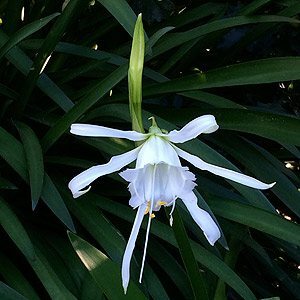 H. festalis is known as ‘The sacred lily of the Incas’ and has beautiful white flowers. H. eucharidifolia, which prefers light shade is rarely found for sale in Australia. Hymenocallis (spider lily) require full sun and a moist but well drained position. Dig in well rotted compost or manure before planting 30cm apart. Propagation is easy from fresh seed or by division of larger clumps.